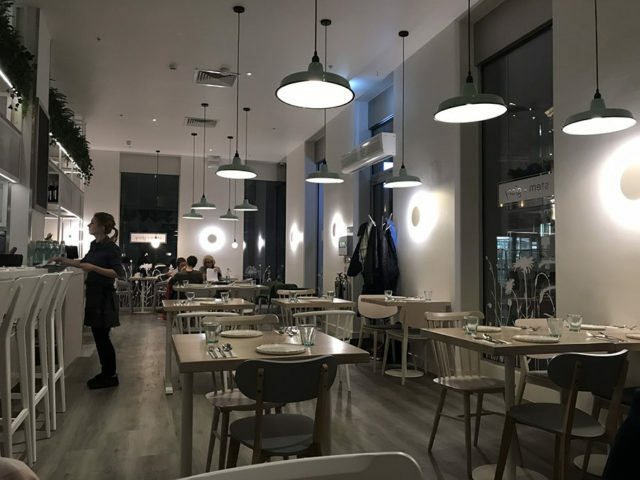 Louise Palmer-Masterson is a crowd-funding winner, with her London branch of Stem + Glory, blossoming from the parent restaurant in Cambridge, which opened at the beginning of this year to coincide with Veganuary. 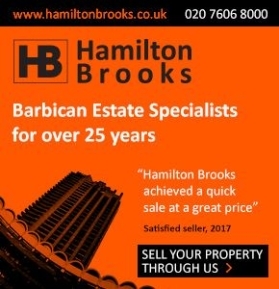 The funding round was achieved within 6 hours of opening the page to the public. London Stem + Glory is perfectly placed, both morally and price-wise, and (as we reported in the December issue) a long-awaited prayer answered for our veggie and vegan loving residents. 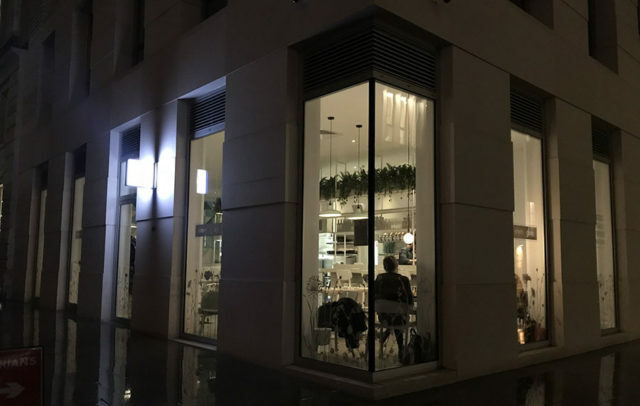 The second of our new restaurant openings in the Bart’s Square area, Stem + Glory is less about grandiose impression and more about modern no-frills diner. 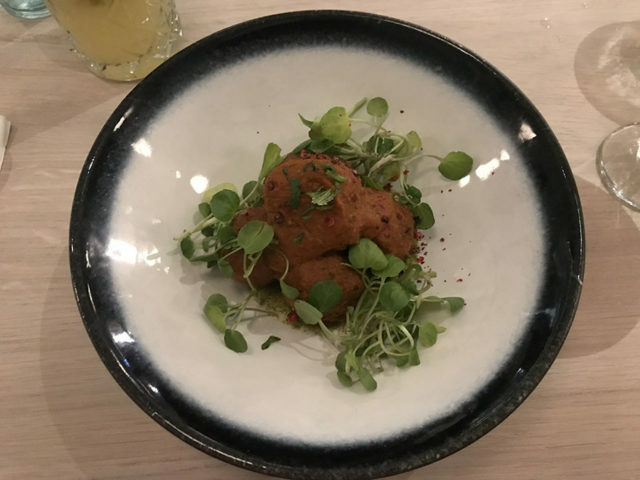 The focus is very much on the food and service here and the restaurant is keen to get things right in the most caring way. Relaxing cool colour tiles and clean modern furnishing surround a central kitchen with a bar separation, so eating alone isn’t a problem here, but there is also plenty of well-spaced tables and chairs and some padded pew seating around the walls. Unisex bathrooms were spotless and pristine following through with the Scandinavian style from the main restaurant. We were there on a Tuesday evening and the place was comfortably busy but not packed which is probably typical for a Tuesday. Welcomed to the table, it is automatically set out with water (something I love and nice not to have to ask) which is also topped up without request. Stem + Glory has a very well-stocked vegan bar with beer and wine, but we opted for a couple of mocktails. 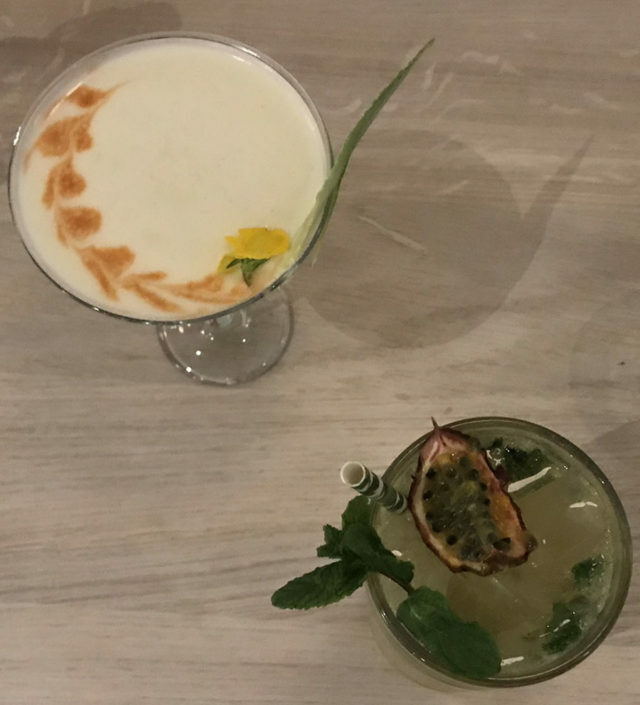 I was pleased that the passion fruit mojito wasn’t as sweet as I was expecting it might be and the mixer was sparkling so the whole tasted like an intense passion fruit-ade. The creamy mango colada was an enjoyable throwback to the 80s and not something to be too embarrassed about since it arrives in an elegant martini glass. Mango Colada and Passion Fruit Mojito. The evening options are varied. You can opt for a few plates to share or a more traditional structure of starter, main and dessert. Stem + Glory is flexible enough to handle anything. We started with the Vegan Meatballs and Patatas Bravas. The Patatas Bravas were ‘just the right amount of’ mildly spicy, calmed and complemented well by the creamy mayonnaise. This dish would be big enough to share as a starter but was definitely something I’d order again. The vegan meatballs were also very filling and tasted so meaty that we couldn’t believe we were eating vegan here. The meatiness was of a texture you’d find in a moist falafel, full of flavour in a rich tomato-based sauce. 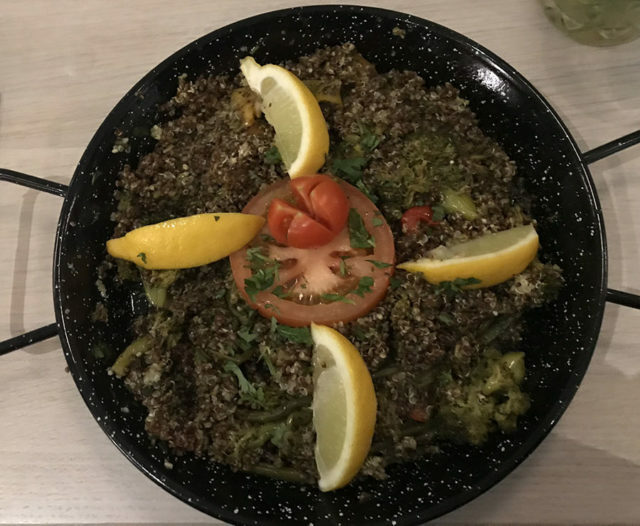 For the main course, we shared two main dishes: the Cauliflower Gratin and the Quinoa Paella. Both were substantial and filling but if we had to choose, then the Cauliflower Gratin took the edge ahead with its mouth-watering casserole-type sauce on the base and its rich smooth cheesy topping. The photo of the paella doesn’t do it justice. It was incredible and another massive portion size. The quinoa gives the substance and the skill of the chef comes through quite amazingly in this dish, so full of flavour that you don’t miss the fish at all thanks in part to the subtle nori dressing. Stem + Glory has a menu of desserts which is decided on daily by the chef; sometimes cakes, sometimes puddings and today it was ice-cream. 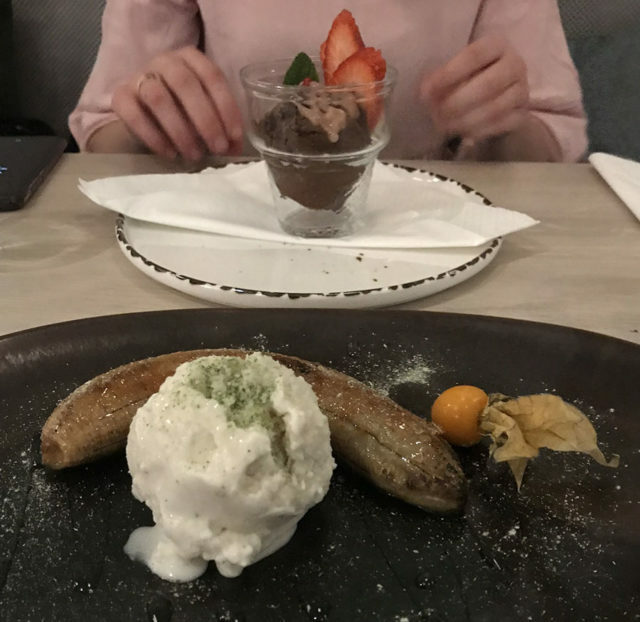 We enjoyed a portion of Chocolate Ice Cream with Rhubarb Cream and a ball of Lime Ice Cream with Grilled Banana. The chocolate ice cream was very, very rich but perfectly offset by the thick tangy rhubarb cream. One scoop is plenty and even then we shared it. The lime ice cream was amazing and incredible, not unlike heavenly clouds with a strong lime attitude and slight undertones of coconut. The banana also gets a 10/10 with its sweet sugar glazed coating like a vegan crème brûlée crisp. Stem + Glory is well-fitted to this location with its intimate residential village feel, and it is surrounded by new residents. The restaurant opens for breakfast, brunch, quick eats and take-aways, and also dinners in the evening. In Cambridge, their special 7 course taster menu events are legendary (bookings sell out in hours) and we’re looking forward to those! You are eating for taste’s sake here. 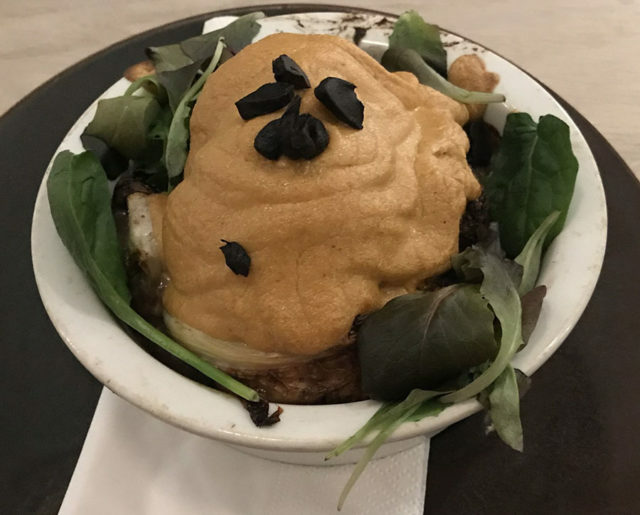 Some dishes have a friendly face and are normal dishes made vegan by skilful replacement, other items on the menu are power punches of veggie goodness in huge delicious bowls, and there is plenty of choice, from quick snack to starving workman. I haven’t even mentioned the smoothies, which I think are going to go great guns in the summer. Stem + Glory is riding the wave of conscious attitude shifts towards plant based cuisine, animal welfare and eco-friendly consumption. Take your tastebuds for a surf with this brand new vegan restaurant. Stem + Glory is currently offering 20% off for first time diners – see web site for details.